I’ve poured over Vogue, NAP and Matches, browsed my high street favourites and I must say I am pretty uninspired. I’ve seen very little that I am interested in buying for winter. It’s actually quite a surprise that I have seen little. Ok so I don’t like pink much but apart from that A/W’s trends are some of my favourites – lots of black, masculine cuts, shearling, leather, and baggy jeans and trainers still feature. As I mentioned before, I am in the middle of a serious clothing cull. I keep things for decades and am pleased if they get one wear a season. It would be okay if I had five or ten things that fell into this category. Embarrassingly I have closer to 100. Ten grey tshirts, not one of which I love but one that will go with x skirt and justify me keeping them all. It is just too much and I have been very serious in my attempts to get rid of things and not to do those crazed H&M dashes. I will be buying better in future. Better, happier, more sustainable. Enough moralising. I do have my eye on a few things. At the moment all I want to wear is my lovely J Crew neon Cashmere Tippi (here but I can’t see the same pink anymore) It is bright enough to sate my colour lust (one of our lovely readers called me a “colour magpie” which made me smile) and the balance of warm but cool that only cashmere can be (in my humble experience) I have the black tshirt version from a few years ago but am very tempted to purchase another with the 25% code I have. I am seriously kicking myself for not buying the yellow neon when I had a chance. Every day I think, “if only I had the J Crew yellow neon sweater….” Hey ho. 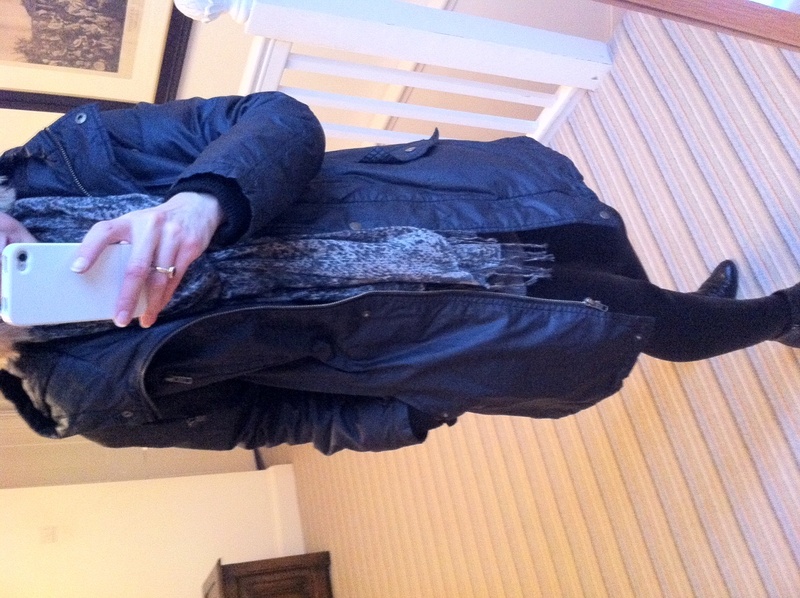 I am also rueing the return of the La Redoute Shearling coat I bought in the sale last year. I loved it but was worried I had spent too much money and it had to go back. 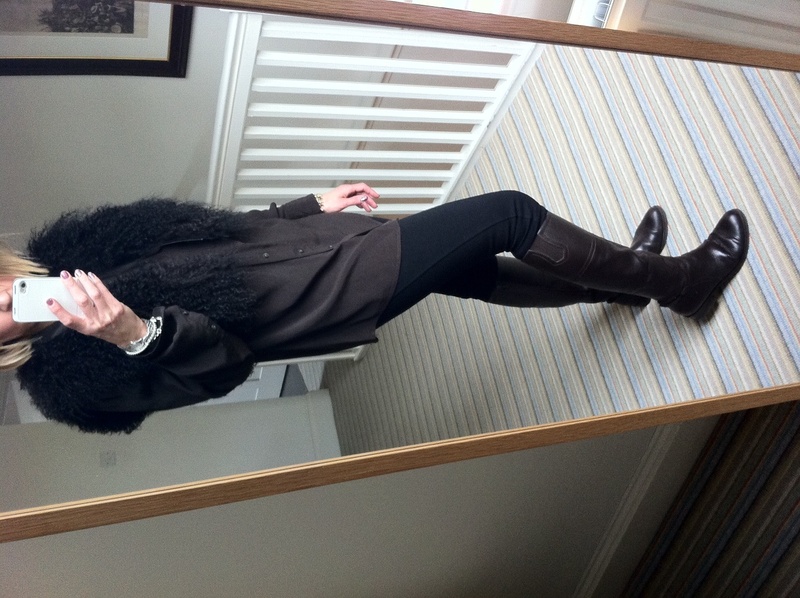 I have had a long term love affair with shearling though and have a few pieces I am going to bring in to daily wear including my black shearling Zara stole. I love boiled wool. I think I’ve mentioned before the boiled wool funnel neck jumper my mum has had for many years from Stefanel. I’ve been looking for similar for over a decade. 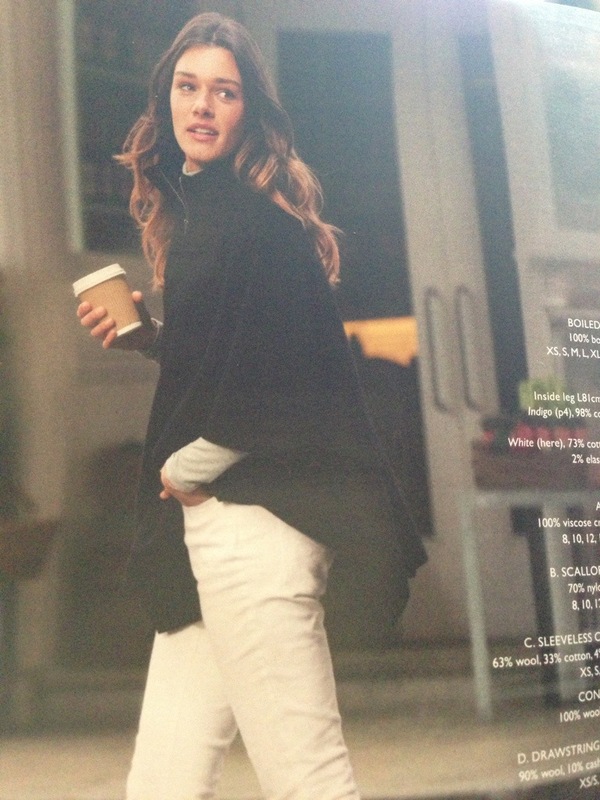 This Boiled Wool Cape from The White Company looks similar though it might be too similar to my draped black boiled wool coat. I also really like this Chunky Button Poncho from The White Company, though I’m slightly concerned that being 100% merino wool might mean it leaves fluff on anything I’d wear it with. And the quality of the jumpers I’ve had from there in the past hasn’t been fantastic though this may just be me? I am hoping to find a Cos version of the Acne Wham oversized sweater (or a NAP discount code!) Then I will discard all the similar sweater dresses in my wardrobe that no longer fit / have moth holes etc. 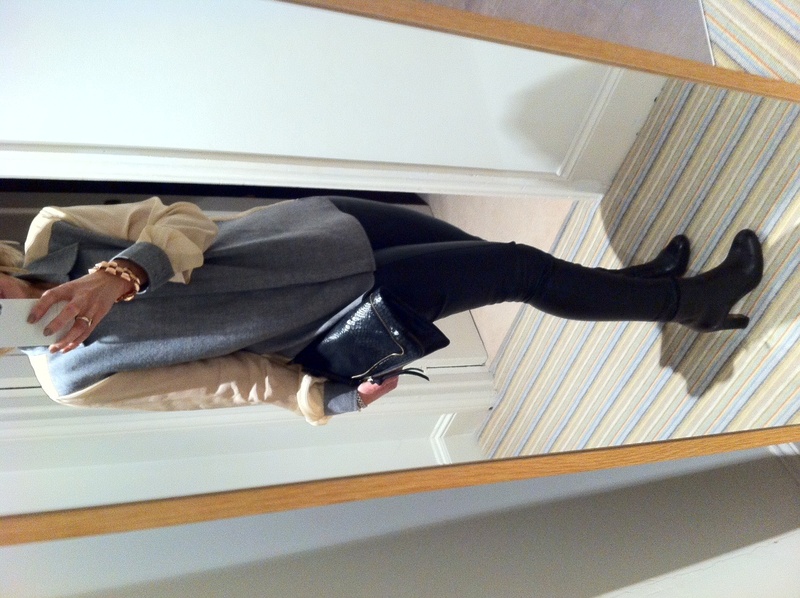 These J Brand grey leather trousers are what I really, really, really want. There must be a High Street pair that would be far better suited to my budget and lifestyle (“paper thin leather” worries me) If you have seen them, please let me know! Boots wise I am sorted. 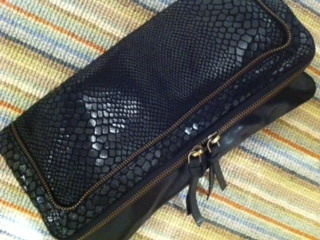 I was lucky enough to be gifted these shearling lined Acne Pistols for my birthday. I bought the Ugg Gershwins last year for when it is really cold and my Ash Jalouse in stone and black are still going strong. 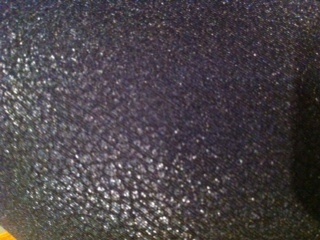 I also have my Belstaff biker boots which will last me years more. I am not planning a new coat purchase either (not a very aspirational wish list – sorry) I have my Barbour Arctic Parka for when it gets freezing, my Zara parka from last year, as well as the grey Zara coat with faux leather sleeves which I still love. I am even tempted to give my almost unworn Zara navy studded sleeve coat to my beautiful sister. This is a jacket rather than a coat but I am trying to resist the temptation to visit a River Island to try it on. That’s all for now. What’s your major current clothing lust? Please do share. 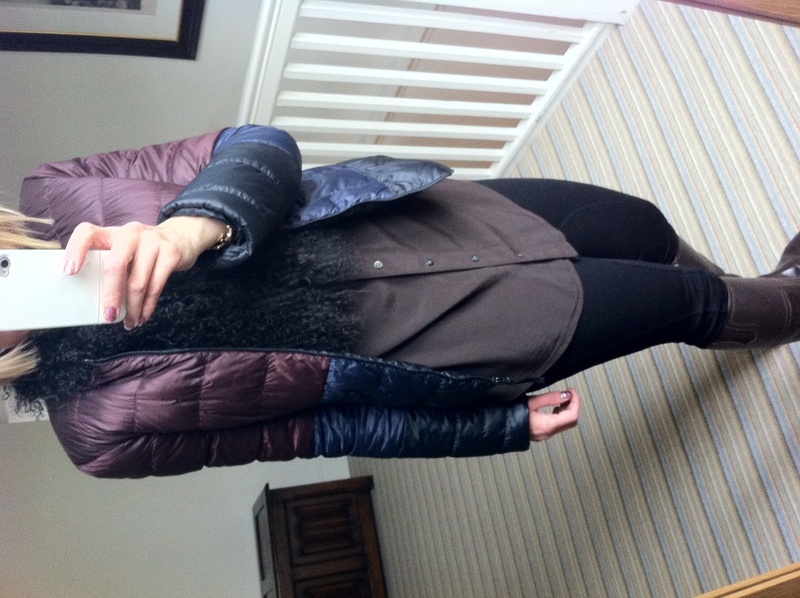 This entry was posted in Acne, All Saints, Ash, Barbour, Belstaff, Cos, Day Birger & Mikkelsen, Diesel, H and M, J Brand, J Crew, Net-a-Porter, Outfits, River Island, The White Company, Ugg, Zara on September 12, 2013 by Eve WornOut. I don’t wear skirts much. The occasional maxi and very rarely a mini skirt but they just don’t seem to fit with my life. Too long (London’s streets aren’t the cleanest), too short (bending down to pick up La Bambina is a happily frequent activity), and so most skirts are saved for days when I won’t be tramping the grubby streets or am sans enfants – both very rare. Well now I’ve found the tube skirt. 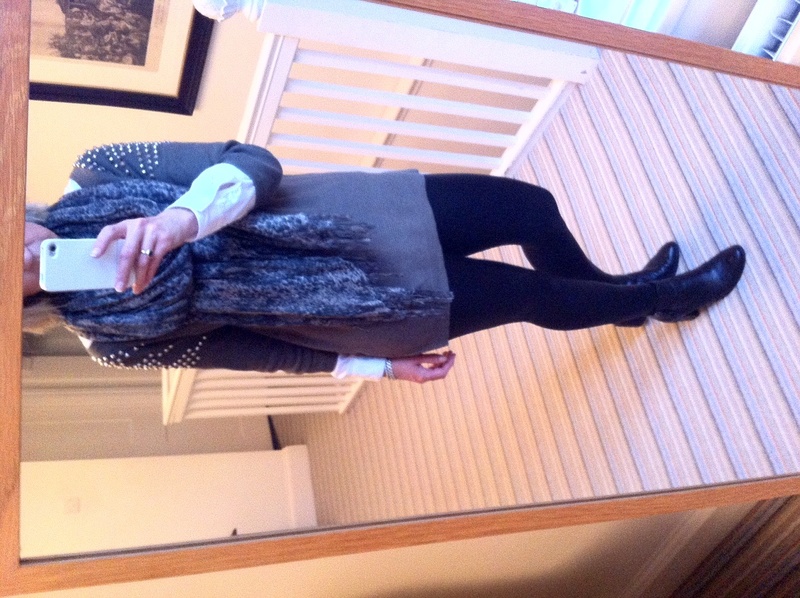 I tried this Topshop grey one on and liked it though admittedly that may be because it is covered in stars. I think it looks practical but I am not yet 100% convinced. I’d wear a tube skirt for work no problem (not this printed one perhaps) but for play? It’s the only thing apart from dungarees that has made me wonder if I am a bit old for a look. It doesn’t help that my 14yo sister has a similar one but she wears hers with Converse and a cropped top which I will not. I had a look on Pinterest and there are lots of tube skirt and vest / shirts combos which just do not work on my size chest. I tried it with a denim shirt which made me laugh out loud, a sheer vest which made me look like a TOWIE extra, and a belted volumnous silk top (Day Birger & Mikkelsen above) but it just does not work. I like it best with a black tee and black Gigis but maybe I should just send it back and stick to shorts when I want to feel the sun’s rays on my legs. If you like them Topshop have a lovely selection. I have looked at the orange safari print one above many times. 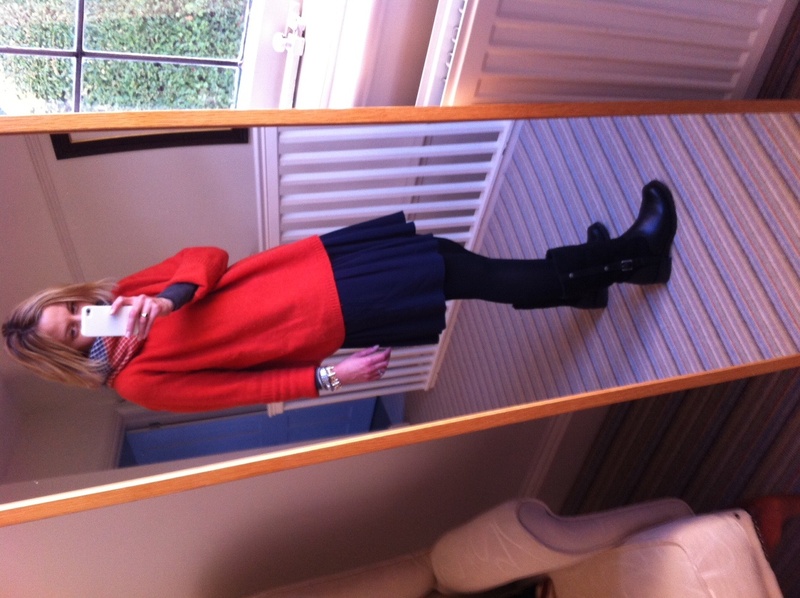 I am yet to be convinced by the tube skirt though so think instead I might suggest it to my super cool little sister. 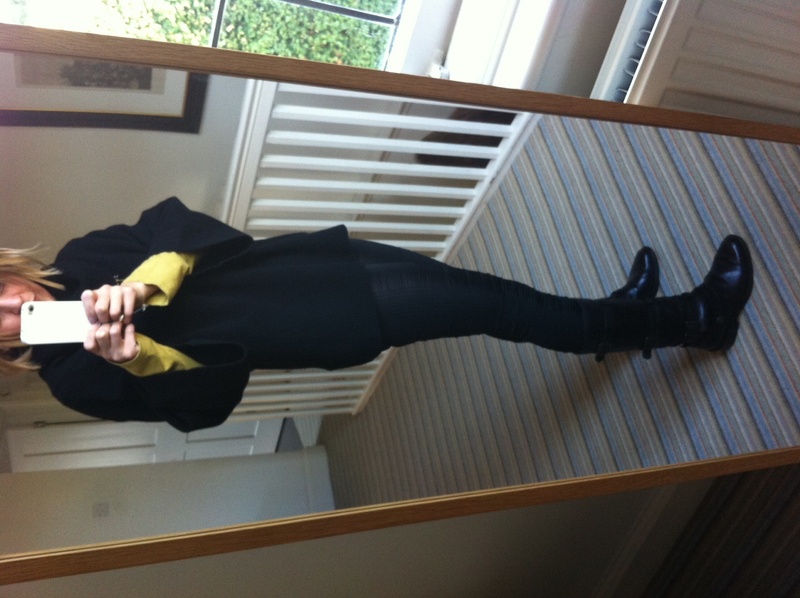 This entry was posted in Day Birger & Mikkelsen, Outfits, Topshop on May 9, 2013 by Eve WornOut. I had planned to have a frugal January. I have returned every thing I ordered for myself (Massimo Dutti leather jacket and the Twinkle Day Birger dress – so beautiful but it just doesn’t hang right on me) My kids have both had growth spurts though so I have been able to get some shopping release by buying some new stuff for them. Most of my purchases have been vests and plain body suits (H&M all the way) but I have spotted and/or bought a few beauties along the way that I thought I’d share. I love Lindex and they started delivering to the UK last year. This dress is brilliant. These bright blue Metsola trousers are fantastic. I bought them when I was pregnant and La Bambina has worn hers at least twice a week, every week. They wash well and the feet mean you don’t have to worry about socks. They’re reduced in the sale. Had I a 7 year old that would allow me to choose her clothes, she would be wearing this beautiful smock from AlbaBaby. There are some brilliant discounts on Mini A Ture clothes at Yellowlolly. I haven’t ever ordered from them but I have this beautiful cardigan in my basket. La Bambina has the jumper version already and it is beautiful. I got her some gorgeous new grey harems from Lindex which she wears it with. Bonpoint at half the price with a Nordic twist! Please let me know if you’ve seen anything lovely for little ones? This entry was posted in Children, Day Birger & Mikkelsen, Massimo Dutti, Metsola, MiniATure, Nordic Kids, Stripes Fashion, YellowLolly on January 12, 2013 by Eve WornOut. Saturday 1st December and for me it was the first Christmas bash of the season. It was freezing here on Saturday night which actually only added to my festive mood so I really went all out for a wintery (for which read: furry) and glitzy (for which read: pile on the bling) party look. 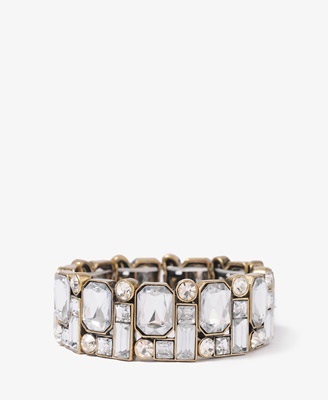 Bracelet (and necklace not seen) from Forever 21 – the credit for these finds again has to go to Kat over on Does my bum look 40? Thanks Kat! Last time I posted with a selection of outfits, it did make me acutely aware that perhaps I have become a bit of a formulaic dresser. I think we all do this to a greater or lesser degree – I mean, we all know the shapes that suit us or that we feel most comfortable in and I guess we tend to stick to them but, even so, I decided to make a real effort this week to break out of the skinny jeans and leggings that are my mainstay and bare my knees. However, this has only served to highlight to me that my skirts options are just as formulaic in their own way as my trousers – short-ish flared skater skirts anyone?! But still, at least I tried….and I did at least add a bit of colour in there! 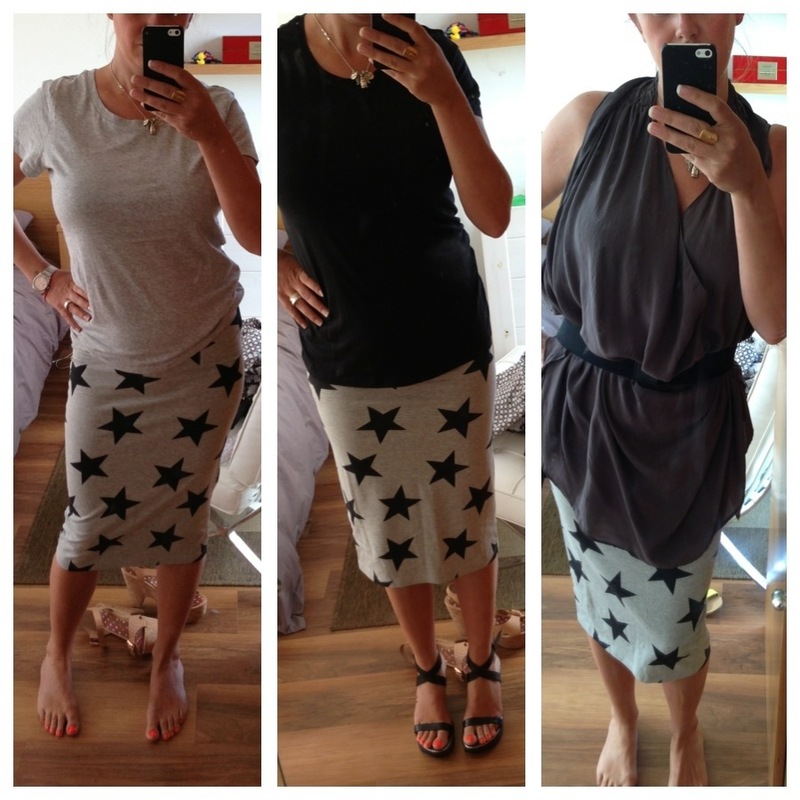 Okay, so this one wasn’t a skater style skirt….. This was actually today’s outfit for a long leisurely Sunday lunch at a friend’s house with another close friend and all our families…. 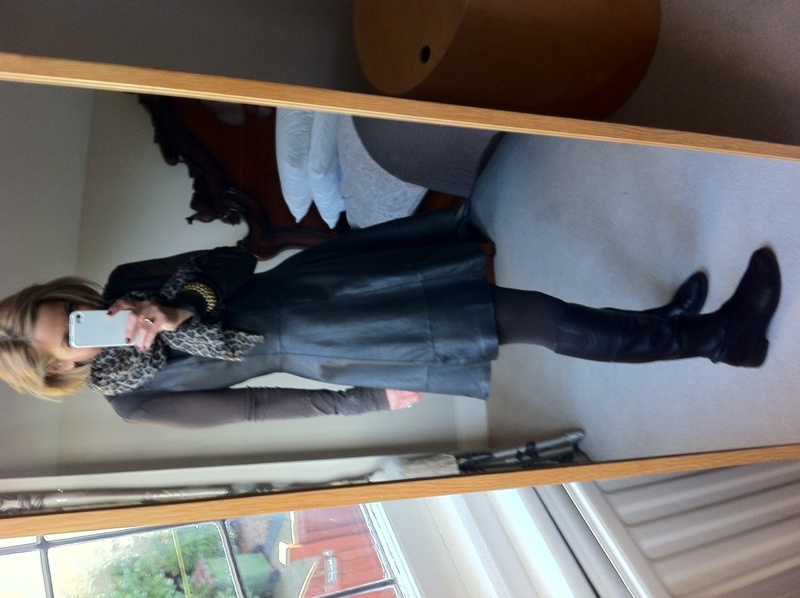 I did think maybe the leather dress teamed with knee high leather boots was a bit much for lunchtime but I think I got away with it. Certainly my husband, always one to err on the side of caution and temper the worst of my sartorial excesses pronounced it to be fine for daywear. 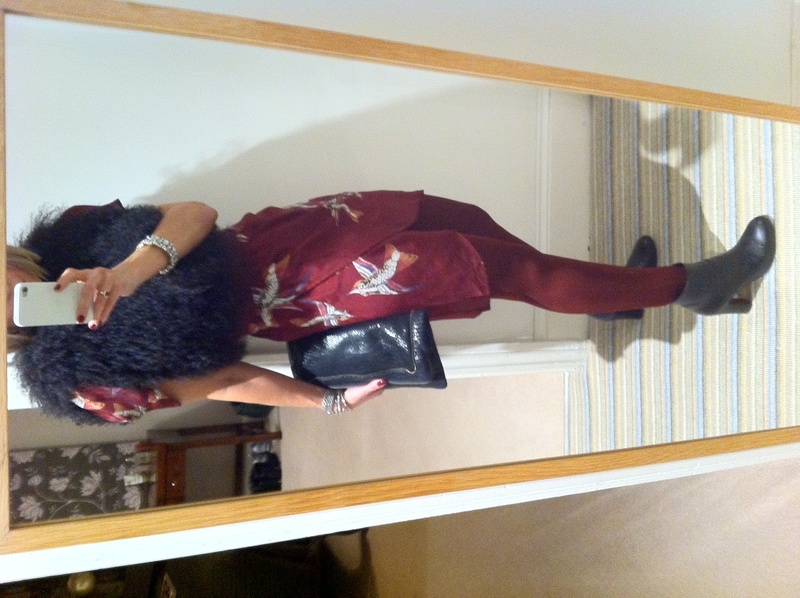 This entry was posted in Accessorise, ASOS, Comptoir des Cotonniers, Day Birger & Mikkelsen, Forever 21, Kew, My-Wardrobe, N Peal, Outfits, Pied a Terre, Primark, Sonia Rykiel, The Outnet, Topshop, Ugg, Urban Code, Vanessa Bruno, Warehouse, whistles on December 2, 2012 by Nat WornOut.